Rumble Fishing is a battle minigame in Mario Party 4. 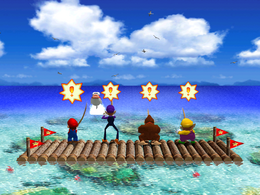 The camera shows a shot of the sun, before tilting down to the four players on a dock, backs turned and holding fishing poles. The players will turn towards the camera, the winner celebrating while the losers sulk in disappointment. Rules – "Be the first player to reel in the Cheep Cheep! Whoever reels it in the fastest wins!" Advice – "When you feel the rumble or see a "!! ", press the button as quickly as you can." Spanish ¿Han picado? Has it bitten? This page was last edited on March 30, 2019, at 16:03.